Yaz learns the troubles of walking your own history perhaps more harshly than any Doctor Who companion before her. One of the many changes brought to Doctor Who this year is more companions than a dimensionally transcendental phone box knows what to do with. Much of the season so far has left one new traveler—Mandip Gill’s Yasmin Khan—taking a backseat. But “Demons of the Punjab” finally let her shine. “Demons of the Punjab” sends the TARDIS back in time to 1947, just as India announced both its independence from the British Empire, and the creation of a second nation state, Pakistan—and the hastily-drawn boundaries from the British government, made along Hindu and Muslim-majority population lines, that would create an unprecedented refugee crisis that killed and displaced millions of people. While this offers teaching moments for every one of our heroes—even the Doctor, whose post-regenerative naiveté is the catalyst for catering to Yaz’s demand to visit her family history in the first place—it’s above all most important to Yaz, who has so far spent a lot of this season mostly in the background while the focus rested on Graham and Ryan’s still-uneasy relationship. 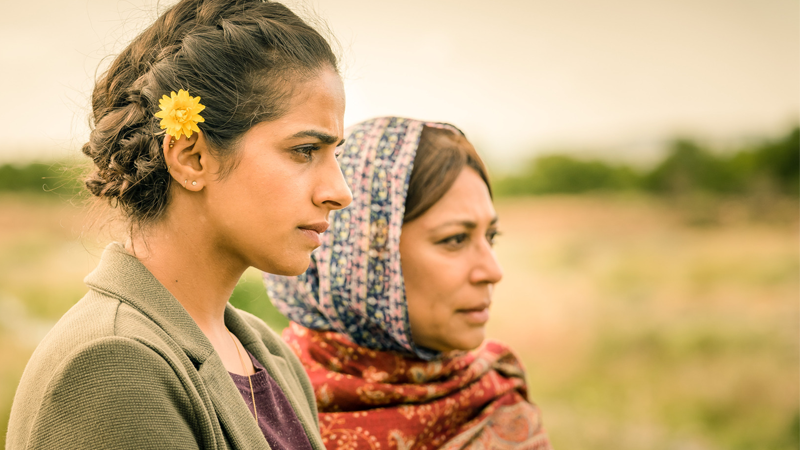 As well as being a great showcase for Mandip Gill, the arc her character goes on through “Demons”—her inquisitive nature sparking the desire to explore her nan Umbreen’s past, having that nature challenged by finding a tragic family secret in said past, and then the burden of that knowledge putting her through both witnessing heartbreak and developing a stronger bond with her nan in the present—offers an interesting mirror to the more “sci-fi” arc the Doctor goes through in this episode. The Thijarians might not be your typical Doctor Who monsters, but you’d almost wish they were with this gorgeous prosthetic work. Like Yaz, against her own best wishes, the Doctor’s curiosity can’t be helped the moment she learns that the “demons” plaguing the Punjab are actually aliens from a race of ancient assassins. Her prejudices of them are challenged when said aliens, the Thijarians (who had some truly incredible makeup work that makes me a little more regretful this season hasn’t had as many traditional “creature feature” episodes), reveal themselves as mournful atoners instead, witnessing forgotten deaths of the past to honor their destroyed world. In revealing the reason for their presence, the Doctor is then forced to deal with her own burden of knowledge—knowing that Prem, Umbreen’s first husband, would become one of the untold numbers of victims killed in the violence sparked by the partition—as she has to once again bear witness to a moment of tragedy she can’t prevent. Ultimately though, it’s an important lesson for this latest incarnation to learn, and one that strengthens her bond with Yaz going forward. It’s an interesting parallel, considering “Demons” is another episode of this season that pulls away a lot of the science-fictional layers Doctor Who typically ensconces itself in when presenting an educational moment, whether in a historical context or otherwise. While nowhere near as necessarily blunt as “Rosa” was—in order to explicitly root its lessons about race as something not just consigned to history—“Demons” encapsulates its lesson in two cornerstones of what makes Doctor Who the show it is: finding parallels between the grounded, real experiences of its characters and the sci-fi wonderment its framing provides. It isn’t as stripped of artifice as “Rosa” was—and doesn’t lean so much into it as another similar episode, season one’s “Father’s Day,” which saw Rose Tyler learn not to interfere with her own tragic family past through the medium of, well, time-eating bat-dragon-things—but strikes a more even ground between the two. That’s not to say that either “Rosa” or “Father’s Day” were bad for not finding a middle ground between human drama and sci-fi as “Demons of the Punjab” did to tell Yaz’s story. If anything, it’s the opposite—that the show can do this speaks to the great diversity of Doctor Who’s storytelling conceit, that it can find these distinctly different approaches to a familiar theme. But it also speaks to the idea that this sort of storytelling is, at its heart, quintessentially Doctor Who. It may not have explosions or villainous aliens to send us scurrying behind the sofa as we may typically expect—much to the chagrin of some corners of the Who fandom—but it is nonetheless something Doctor Who has been doing for years and years, and “Demons of the Punjab” is just the latest successful attempt at bridging its grounded heart and its more timey-wimey elements. And yes, that means it’s more of the familiar, but in advancing Yaz’s characterization so keenly—while offering a moment of educational history the show’s never covered before—it at least adds something more to the mix than other variations on a theme have this season. If you want to learn more about the devastating impact the partition had on India and Pakistan—and the misguided preparation the British made for it—Vinay Patel, who penned the episode, had some great links to resources he used during writing on his Twitter, including the 1947 partition archive, which is worth checking out. It took me longer than I’d like to admit to realize that the theme that played over the end credits wasn’t a licensed song á la “Rosa,” but in fact a haunting, melancholic vocalization of the Doctor Who theme. It is absolutely beautiful though. It’s becoming more and more clear as season 11 marches on that the narrative theme tying it all together is the idea of family: Graham and Ryan’s being shattered by the death of Grace in the opening episode, the new Doctor finding herself a new one in the form of her latest companions. Yaz is now on that arc too, albeit more introspectively than her fellow wanderers in the fourth dimension—exploring past connections she had never considered the real importance of before, rather than having to tackle the idea of having lost family. Where it’s all leading remains to be seen, but it’s about damn time that Yaz got the chance to be on board with it.